Handwritten Correspondence: Where Have You Gone? We live in a tech savvy culture. We live in a tech dependent world. I, for one, miss the personal touch of a handwritten note. I miss getting “real” mail like letters, cards, or invitations in the distinctive hand of the sender. Don’t you wish that when you opened your mailbox that you were buried under an avalanche of personalized handwritten correspondence? Instead we are buried under an avalanche that consists of coupons, bills, advertisements, and solicitations. Credit card companies have gotten wise to the fact that people want mail that contains even the faintest whisper of personal connection. The most recent “please get our credit card” solicitation I received, looked like a wedding or baby shower invitation; which is the only reason I opened it rather than immediately shredding it. Right after college I spent a lot of time sending cards and notes to my friends. Back then it was cheaper to put a stamp on an envelope than to call. At least once a week one of my closest friends received a handwritten note from me. Taking great care in picking the right card or stationery. Writing an outline of the stuff I wanted to share. Why? I don’t know. Selecting the perfect pen based on color, point, type, etc. Print or cursive or a combination. I loved it. Sitting at my writing desk and spreading everything out. Each letter had to be unique based on the person who would receive it. My life wasn’t exciting and there wasn’t much to tell but I put a lot of effort into telling the story in the most interesting way. I wrote about work stuff, family things, books and movies. Nothing Earth shattering. I was too busy writing about life to live it. Keep in mind I didn’t get much handwritten correspondence in return. Sometimes it was okay but sometimes I wanted reciprocity. More than anything though, I was glad that I afforded some of my friends with a moment of joy. Then life got busy to the point where I had to live it and my letter writing slowed. Enter the age of “cheap” long distance. I remember getting offers to change services, from 7 cents to 5 cents to 3 cents. It became cheaper to call. One commercial advertised a woman talking about calling her sister to “talk about nothing for hours” because it was so cheap. That’s what my sisters and I did. We’d sit on the phone and watch TV together like we were in the same room. Following the cheap long distance age came the Hotmail age (dial up and slow connections but quicker than sending a letter by post). Email made correspondence easier and quicker. Then came the cell phone in every hand and texting. Now we live in the age of the SmartPhone with Facetime & Skype as options. I miss the personal notes, so I started letter writing again. A few years ago in an intentional personal campaign I decided to bring back handwritten correspondence. Trust me when I say the comeback is a slow burn. But I am committed to it. Imagine my excitement then when PaperMate® introduced a new pen line called InkJoy™. Part of their mission: ‘But most of all, we wanted to bring back the joy to writing …” Awesome, right? It’s aligned with one of my personal causes. I still need to decide if the pens bring me as much joy as their mission statement. Anyway, I’m back at it. Writing letters. Personalizing each note to each person. Buying stationery and note cards that make me smile knowing the person on the receiving end will smile too. Paying the price of stamps and hopefully adding a special life moment for the recipient. When was the last time someone sent you a personal handwritten note? It’s been too long. When was the last time you sent one? Also, too long. Join the mission today … I am calling you to arms or rather to hands … sit down and pen a thank you or thinking of you or miss you note. Choose someone you rarely see or talk to. Choose someone you see every day. Put an “I LOVE YOU” in that special someone’s computer bag or handbag or backpack. I dare you to make someone’s day by contributing to an avalanche of handwritten correspondence. Maybe you’ll be buried under an avalanche too! i believe we have enjoyed discussions about leisurely strolling through stationary aisles. i have an addiction to beautiful note cards. my current problem is that i have far too many note cards for the low volume that i actually send, so i am on a “no buying without using” diet right now. nonetheless, i find that pen and paper elicit a more meaningful prose from me. probably too deep for the recipient. haha. i also enjoy special pens and coordinating ink colors to my note card of choice. in my past, i only used Le Pen pens when writing my notes; they sport a host of colors and feel so dainty in my hand. today, i like a simple old school blue ink Papermate. thanks for reminding me of a part of myself that has been pushed to the side. i feel a need to express some thoughts to special people in my life. thank you. You’re welcome TLC. Le Pen … very nice. I love them when I need/want a porous point pen. I started using my stationery for non-conventional things because I had so much. Also, I’ve gifted pens and stationery to people who I know won’t buy it for themselves but would use it. Than I can go buy new things. LOL! Keep the happy moving. I am joining your campaign – anything is better than bills –and I used to be a prolific letter writer. Unfortunately now, when I do send letter, I use my computer–but use a font that looks like writing and not printing, and print it out on pretty paper -seems I have lost the patience to write by hand. I always add something handwritten though. It’s still a personal touch. I had gotten to the point where I even printed off the address labels. Have to start some where, right? I’m a sucker for ALL pretty paper. 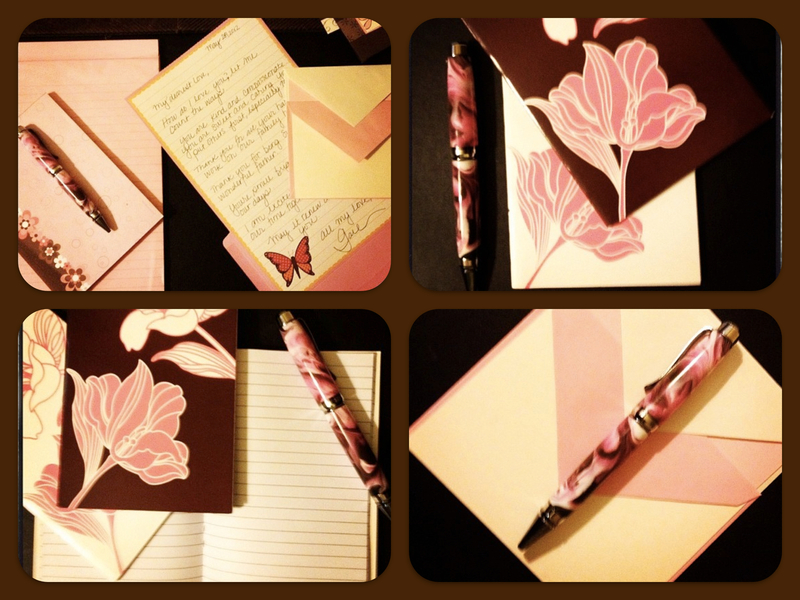 I went to the paper store today and got a nice pen and some cards – all thanks to you and this post! Thank you!!! LOL! You’re welcome. I am so excited. The stationery store for me is like a candy store for a kid with a sweet tooth. Fabulous. Happy handwriting! Hahahaha … welcome to my world! Funny about that. Other than little love notes from my husband, I’m actually fine with first typed and now email. Maybe because I learned to touch type when I was really young and since then, writing anything my hand has been really hard for me. But I do appreciate the sentiment! If I hand wrote anything, I’m not sure I could read my own writing, much less expect anyone else to figure it out! I LOVE this. I write handwritten thank you’s after interviews. I should show such respect to my loved ones!! Sign me up for your campaign. Consider yourself in. Send some letters this week. My fav. disposable is BIC Cristal Bold in blue but they make vibrant colors too. You may want to check those out. And then I have the pink swirled pen from the photo. Plus I collect whatever I find that’s fun. A letter holds much more emotions than a blunt email. And the feel of it is amazing. Its just liked deciding between books and e-books. E-books just can’t have the same feel. There’s something special about getting a letter. Absolutely agree! Only “proper” letters I get are bills and bank statements. Don’t get me wrong, I really appreciate the speed of text and email but I miss letters too! The more we can interact through phones, SMS, Skype, IM, the less we communicate! Do I want to write a letter? There’s an app for that! It’s called a pen! LOL! There is an app for that. Love it. And I am all about a good pen. Gail, we’re both on the same page. Only difference is you put it so well on paper AND you follow through. Love this. Thank you. Yes. I sent three thank you cards this week but have three thinking of you cards to write. I share your passion for written correspondence as well. And that mention of Inkjoy was very helpful. Great post! Thanks for reading. InkJoy is nice not sure if they are my favorite though.